The ninth issue of The Happy Hypocrite, a biannual journal led by various artists’ writings, will be edited by Hannah Sawtell and she has put a call out for contributions. Titled #ACCUMULATOR_PLUS, it will be published in September of this year and extended to be broadcast as a radio show. The new issue aims to ask how sound and writing interact, and how, in line with Sawtell’s work, we may relate sound to text, and text to sound. 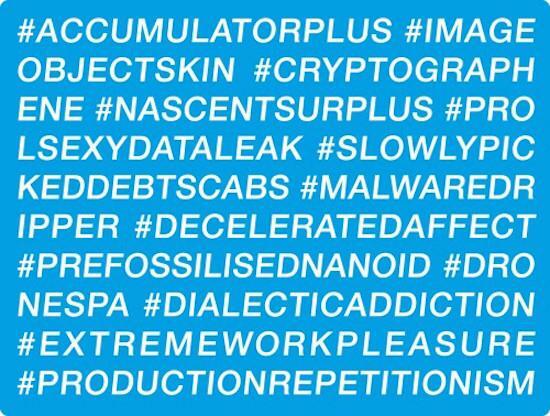 Applying some of the hashtags used at her exhibition in 2014 at New York’s New Museum, Sawtell is offering these streams of thought out as a means of a call for response. Among them are ‘#IMAGEOBJECTSKIN’, ‘#NASCENTSURPLUS’, ‘#DIALECTICADDICTION’ and ‘#EXTREMEWORKPLEASURE’. This issue will mark the first in the series to accept sound submissions for translation into image or text by Sawtell. The submission deadline is February 1. You can email submissions to happyhypocrite@bookworks.org.uk and find more information here.